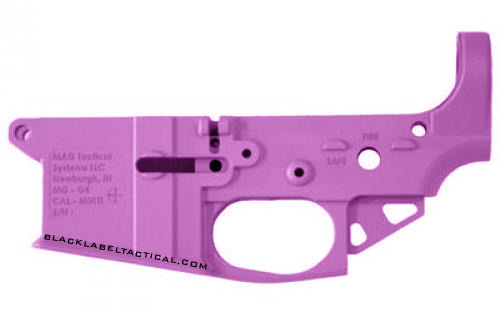 The MG-G4-PNK by Mag Tactical (Division of CMMG) lower receiver pink is the one of the lightest AR-15 lower receiver pink out on the market. The entire stripped lower with out a parts kit weighs only 6 oz compared to a standard DPMS stripped receiver that weights around 9 oz. The Mag Tactical AR15 Lightweight Lower Receiver MG-G4 is just around 33% lighter than an standard receiver and is still a metallic component. No plastic, carbon fiber or polymers with this lower. The Mag Tactical AR15 Lightweight Lower MG-G4-PNK receiver is made of a proprietary magnesium alloy with all the same attributes as your normal aluminum AR15 receiver. Extended Pins for extra strength included and any AR15 parts kit will work with it.